As the suburban house block slowly but surely gets smaller in many capital cities, the amount of space left over for outdoor living is shrinking. But this doesn’t mean you need to cramp a family around a small outdoor table jammed into a corner or go without altogether. It does mean, however, that you need to carefully plan if you’re considering a new Canberra outdoor living area. One strategy if space is limited is to build an outdoor structure for two purposes rather than one. 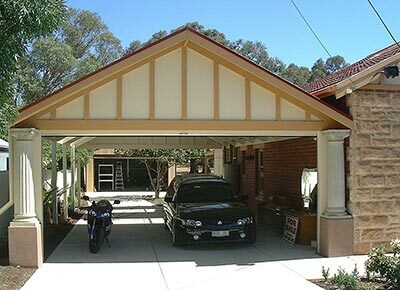 For example, it’s common for a carport to double as an occasional entertainment area. In principle, all you need to do is move the car or cars and a large space is then available – simply add chairs, tables, a bbq and people! This can quickly become bothersome, however, particularly if you entertain regularly. For example, if your bbq and outdoor furniture are a long way from your carport, it will quickly become tiresome moving them whenever you want to use the carport to relax or entertain. That’s why planning your Canberra outdoor living area and carport is so important. What you might plan to do, for example, if space allows, is build a large carport so you can store your outdoor furniture and bbq underneath permanently. If space is too tight, consider buying folding outdoor furniture that can be stored against one wall of the carport and a bbq like a Webber Q that can be situated on a table for cooking. If combining a Canberra outdoor living area and carport you might also consider locating the carport close to the kitchen, installing lighting and fitting a wall or outdoor blinds on the sides of the carport that are exposed to sun, rain or wind. Don’t forget, also, to add some garden beds or other ornamental features around your carport/outdoor living area. While your cars might not appreciate the extra ambiance, you and your guests probably will!